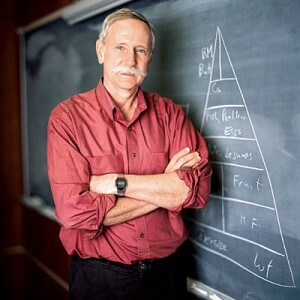 Dr. Willett is the Fredrick John Stare Professor of Epidemiology and Nutrition in the Department of Nutrition and Epidemiology at Harvard’s School of Public Health, a Professor of Medicine at Harvard Medical School, and has been chair of the Harvard Department of Nutrition and Epidemiology since 1991. He is also the author of 2005’s Eat, Drink, and Be Healthy and 2007’s Eat Drink, and Weigh Less. WHAT IS HIS MAIN MESSAGE? Healthy fats should not be feared; they are an important part of a healthy diet. A diet that gets more than 30 percent of calories from fat is perfectly okay as long as those fats are plant-based. Potatoes and table sugar are essentially the same thing. Potatoes should be limited, much like refined grains. Nuts and legumes are preferred sources of protein. Many dietary recommendations are based on politics (i.e. : “for calcium, eat dairy”) rather than a comprehensive understanding of science. Exercise and physical activity are the foundation of health. Dr. Willett created his own version of the food pyramid, which perfectly illustrates these — and a few other — viewpoints. Dr. Willett is not afraid to think outside the box and, armed with substantial research-based evidence, question standard dietary advice (i.e. : “dairy is the best source of calcium.”). I greatly appreciate his strong defense of healthy fats, emphasis on whole grains and plant-based protein, and the importance he places on daily physical activity. Compared to other well-known male doctors who delve into nutrition matters, Dr. Willett is in no way gimmicky, does not endorse or partner up with questionable famous “experts”, and, in my opinion, is the one who most stays true to his convictions. Refreshing — and admirable! His research experience is substantial; throughout his career, he has published approximately 1,100 articles dealing with nutrition and health matters in various peer-reviewed science journals. I wish Dr. Willett were more specific with his fat recommendations. For example, he groups all plant-based oils (including soy, olive, and peanut) in the “healthy fats” group. This troubles me because there is a clear hierarchy. Soybean, safflower, and sesame seed oil are very high in omega-6 fatty acids and therefore not as healthy as olive and peanut (high in monounsaturated fat) or flax oil (high in omega-3 fatty acids). Similarly, Dr. Willett classifies all saturated fats equally, even though those in coconuts and cacao are healthier than the ones in full-fat dairy and red meat (especially from cows that subsist on corn). My main gripe with Dr. Willett’s dietary advice, though, is his view on potatoes. Per his food pyramid, potatoes are placed in the same “use sparingly” category as white bread, white rice, white pasta, soda, and sweets. I find this to be grossly inaccurate and misleading. Dr. Willett is very familiar with — and knowledgeable about — nutrition issues. Like Dr. Marion Nestle, his epidemiological background enables him to analyze and apply clinical studies appropriately, and his consideration of the relationship between food politics and dietary advice adds a powerful “oomph” to his message. Although I find his views on potatoes unnecessarily alarmist and extremist, his overall nutrition message is interesting, multi-layered, and scientifically solid. It’s probably a good time to put the Food Pyramid in it’s proper place – bury it. There are so many versions of it and it does not seem to convey the message. Let’s face it, most people know that fruits, veggies, and exercise are the way to go. After studying Dr. Willett and many other experts, I have come upon a different metaphor . . . something most people can relate to . . . the house http://bit.ly/9hQYNi. We need to move away from specific food-types and gain knowledge in what is causing poor health and obesity. Re: pyramid – Why do they tend to put grains ahead for fruits/ veggies? The latter seem to have a greater and more varied micronutient content, grow more abundantly in nature with a smaller drain on natural resources, and lower calorically (for those with weight management issues). It seems, IMO, that it would make sense to eat in the proportion that one would be able to obtain that food in nature. In short, what makes grains greater than fruits/veggies? I fully agree with you. Fruits and vegetables should both share the base of the pyramid. The newer version of the pyramid looks slightly different than the one in the link above. In the newer version vegetables and fruits share the base. The Walter Willett pyramid you link to does not have fruits and vegetables at the base. The base of the pyramid at your link has physical activity and weight maintenance as its base. Sorry for the confusion. When I said base, I was referring to the food-related portion. Indeed, “Daily Exercise an weight control” appears in the base of both versions.